Someone I love passed me by. My son, my uttermost love, passed me by. One was my son, my uttermost love. My heart in a train running south to north. K was home for two days; that was his surprise birthday present to P. I couldn’t be with him today, I had to be at work. 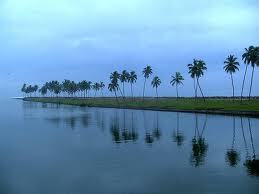 Then, in the afternoon, I rode this train from Alleppey to Trivandrum; and K in a train from Trivandrum to Bangalore. Somewhere near the bewitchingly beautiful lake at Paravoor, our trains crossed, going in opposite directions. I strained to look the fast moving train, hoping to catch a glimpse of K’s face. How silly! I know, but I was awed; I wanted to tell the guys who sat near me, ‘Look, look, my son is in that train!’ Then as we crossed the Paravoor Kayal, the water was silvery and pearly and the sun was so radiant and the breeze was so cool and my eyes were wet and I got a glimpse of the vast sea beyond. Extremely emotional there.I am wondering how a string of words'passed by me' can carry whole lot of emotions, pathos with it..
Glad see your wonderful lines. Perhaps the name lend to the post is debatable. Beside that, I felt the moment I saw the picture of the natural mirror on the lake, I decided that this post must be a telling one. Indeed it is. I can empathise. And I feel all fathers can! @Cherian: Glad you liked it! I myself am mystified how such simple lines could carry that heavy burden of emotions - and am so happy that it could strike a chord in the readers! @Anil: Dey, Perhaps if I put the title after the poem? Or I will delete the 'Indian'. This is the third time You may have changed the post title. The Rail Road was good, made sense with the emotions you expressed and its underlying feel. If one accepts sunset as an optical illusion then one need not mourn that the old are travelling into sunset. My heart in a train running south to north." Good one Balan Sir! We can clearly understand your state of mind. such a limbic love! Every word glistened and every word was deeply felt in the same vein by us, as it was by you. Every parent will go through this, someday even K will :) thats the beauty of this love. I think you enjoyed a lot. Anyway all the best for your next trip.